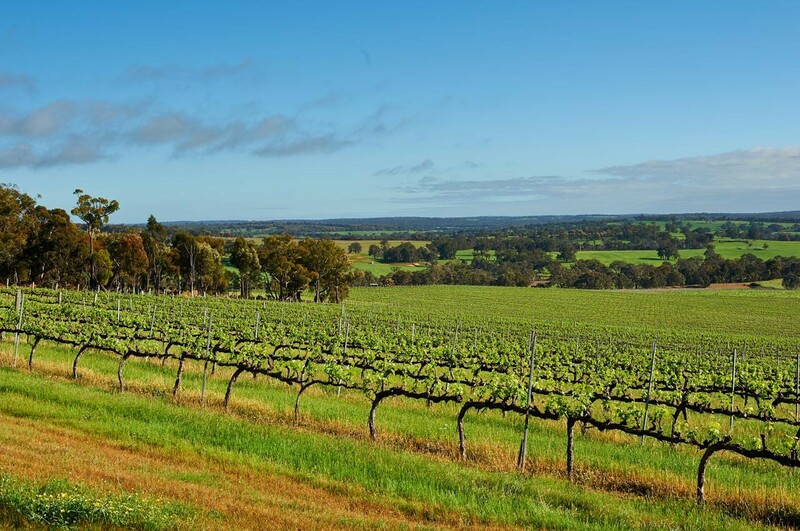 Clare Valley vineyards in South Australia. As anyone who reads these pages knows that I love Riesling. At its best Riesling produces some of the most delicious, light, beguiling, delicious and versatile white wines available. I love all sorts of styles of Riesling from the light off-dry Mosel style to bone dry and mineral versions from many parts of Germany as well as Alsace and Austria. 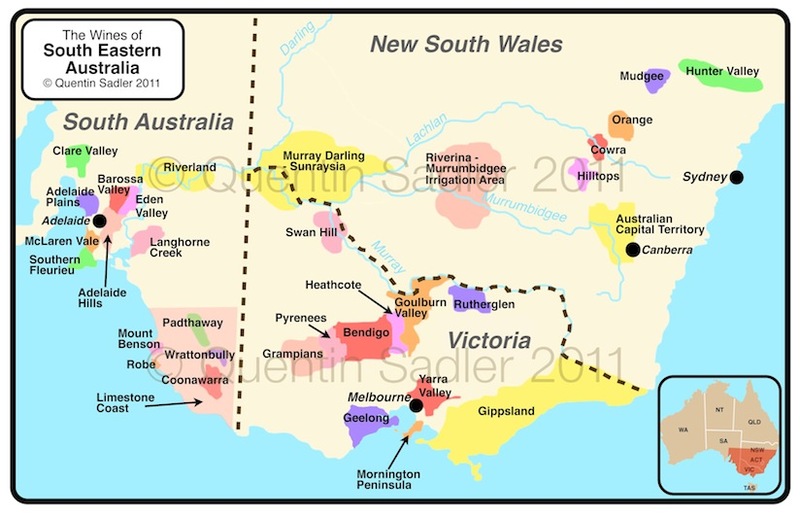 Australia too has a reputation for producing good Rieslings and I have enjoyed many different examples over the years – try this if you get a chance, and this as well. However, I recently tried one that was absolutely superb and it is such great value too that I made it my Wine of the Week. 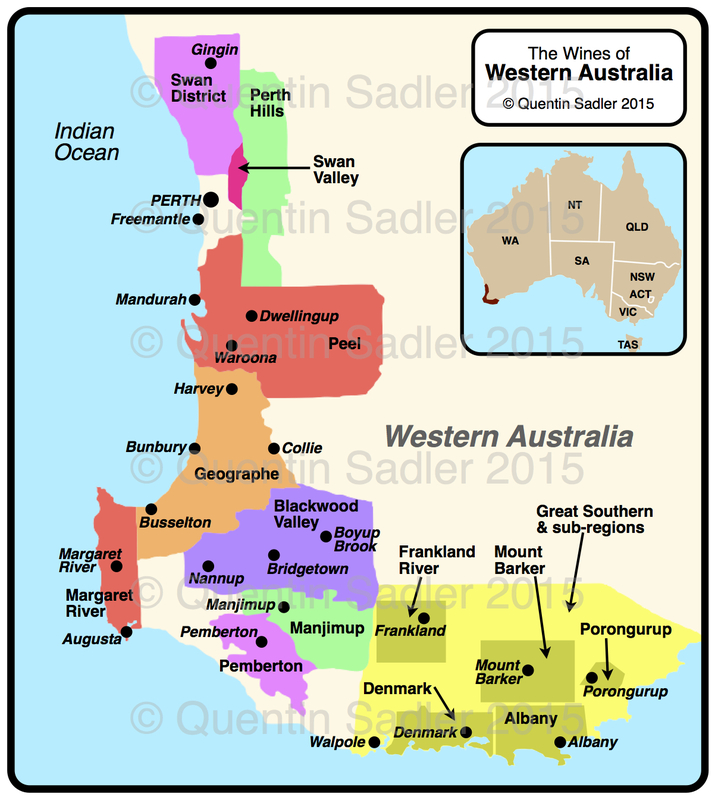 Map of South Eastern Australia, Clare Valley is north of Adelaide in South Australia – click for a larger view – non watermarked PDF versions are available by agreement. 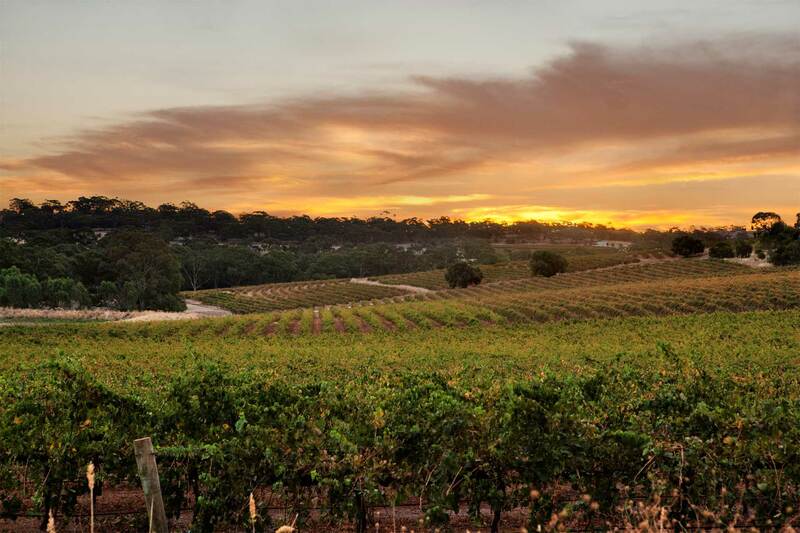 The Clare Valley is an old wine region, having been settled in the 1830s, you can tell because nearby Adelaide is named after the wife of King William IV – he ruled 1830-1837. 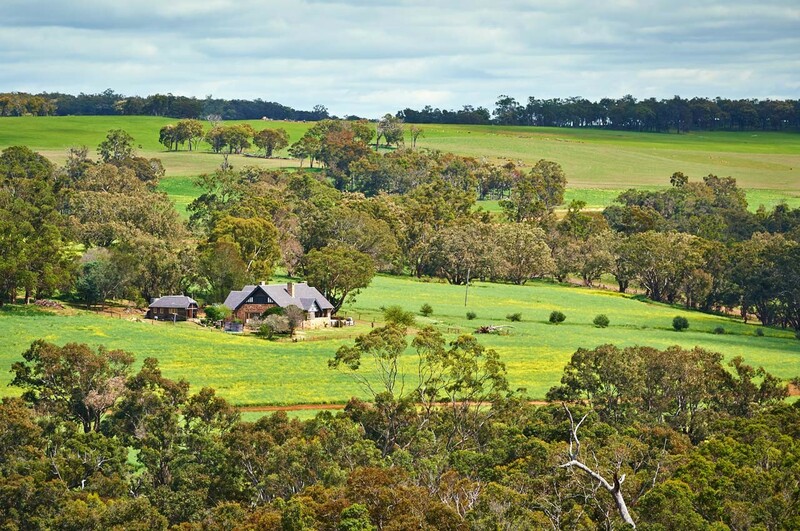 Like many of the places called a valley in Australia, it isn’t really a valley so much as a series of gullies and gentle hills. During the growing season the days are warm, but there are cooling breezes and the nighttime temperature is cool. 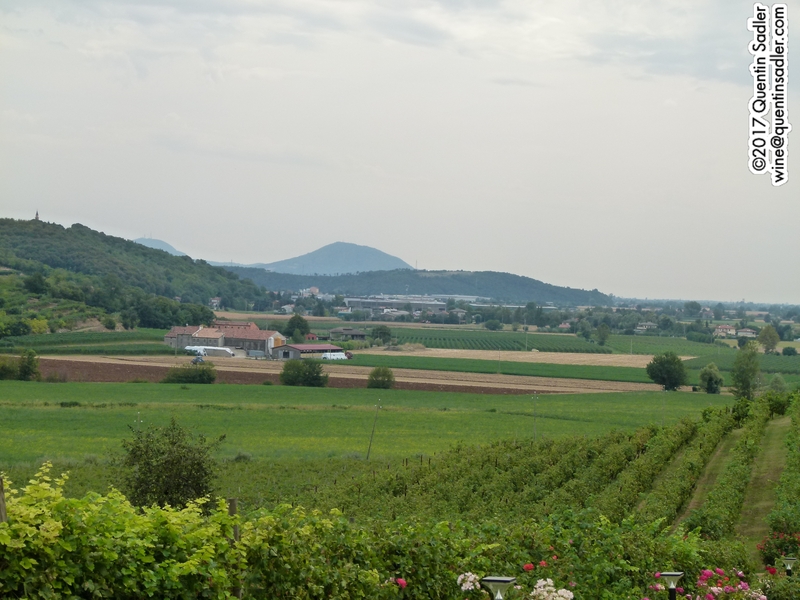 This helps keep the wines fresh and lively and that is why the two speciality grapes of the region – although many others thrive here too – are Merlot and Riesling, both grape varieties that don’t like too much heat. 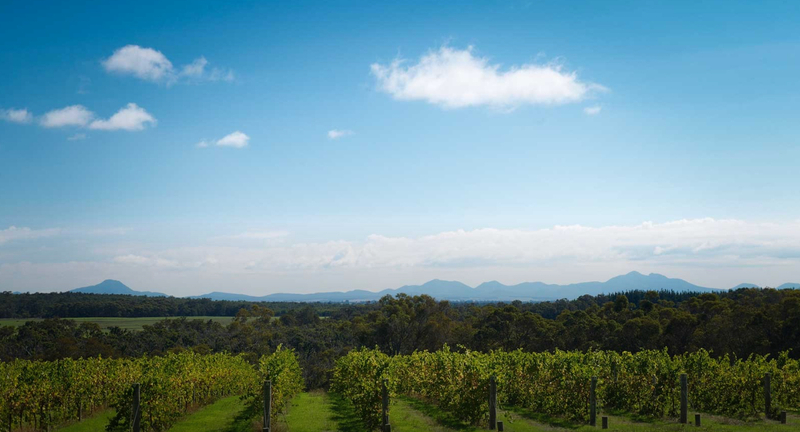 The Blind Spot range is a sort of upmarket own label range made for the Wine Society by Mac Forbes who is one of the most exciting young winemakers in Australia today, the whole range is worth a look if you want to broaden your horizons. This is everything that I want a Riesling to be. It is is bone dry, tangy, mineral, taut and refreshing. It has a pristine, pure quality to it and the palate is drenched with exotic lime, crisp and deliciously drinkable. It is light bodied, but full of flavour, so more akin to the finer and more ethereal Australian Rieslings like Hensche’s stunning Julius Riesling. It has high acid as you would expect, but the ripe lime balances it beautifully. I loved this wine. It is very good quality and it so much better than the price tag would make you believe – 91/100 points. Available in the UK from the Wine Society for £8.95 a bottle. Enjoy this as an aperitif, it really makes you hungry, or with any light, delicate dishes, soft cheese, seafood, spaghetti alle vongole, Thai, Malaysian and Keralan cuisine, anything you dip in sweet chilli sauce, or just as a drink on its own. It will certainly be my house wine for the spring and summer. The Vermouth display at La Casa del Abuelo in Madrid. Until recently I could not remember the last time I had drunk any Vermouth. In my early years I used to sell it and it was so fashionable that it was positioned right at the back of the shop, next to the equally popular Sherries and Tonic Wines – ah the early 1980s really were another country. Recently though I have started becoming aware of Vermouth being much more visible than I can remember for a very long time – I suppose it might be because of the big trend for Gin and Martinis, whatever the reason it is fascinating to see this old favourite having a resurgence, however modest. A Vermouth is a fascinating wine style – even if you don’t like them. It is both a fortified wine and an aromatised wine. Herbs, roots, plants and spices to give the flavouring – the most historically important flavouring is the wormwood shrub, wermut in German – pronounced vermut – from which the drink gets its name. It is worth noting that like gruit and hops in beer, the herbs and spices were originally meant to act as a preservative and to have medicinal purposes too, not just to be a flavouring, in the distant past they probably covered up the smell and taste of some pretty rank wine too! The base wine is sweetened with the sugar syrup or the mistelle. The herbs are macerated in the spirit and this flavoured alcohol is blended into the sweetened wine – it can then be aged for complexity or left as it is for freshness. Apparently the first Vermouth to be bottled and sold was created by Antonio Benedetto Carpano in Turin, Piemonte, in 1786. His invention was the first commercial red Vermouth and a form of it is still available as Carpano Classico Vermouth, while a newer recipe, called Antica Formula Carpano caught my eye recently and that has gone for a bigger flavour and the artisan look, so much so that you could be forgiven for assuming that it is the older product. All other commercial styles – as opposed those made by farmers for their own consumption – seem to have been based on what Carpano created and white, rosé and drier styles followed over time. White Vermouth was apparently created by Dolin in Chambéry in Savoie in 1821. Interestingly Chambéry is just over the Alps from Piemonte and in 1932 Chambéry was created an appellation contrôlée, or PDO, the only one for Vermouth. In my youth I remember enjoying Dolin’s Chamberyzette – available here and here, this is their white Vermouth blended with wild Alpine strawberry juice – I used to love, perhaps I still would if I tried it? The wonderful menu mirror at La Casa del Abuelo. 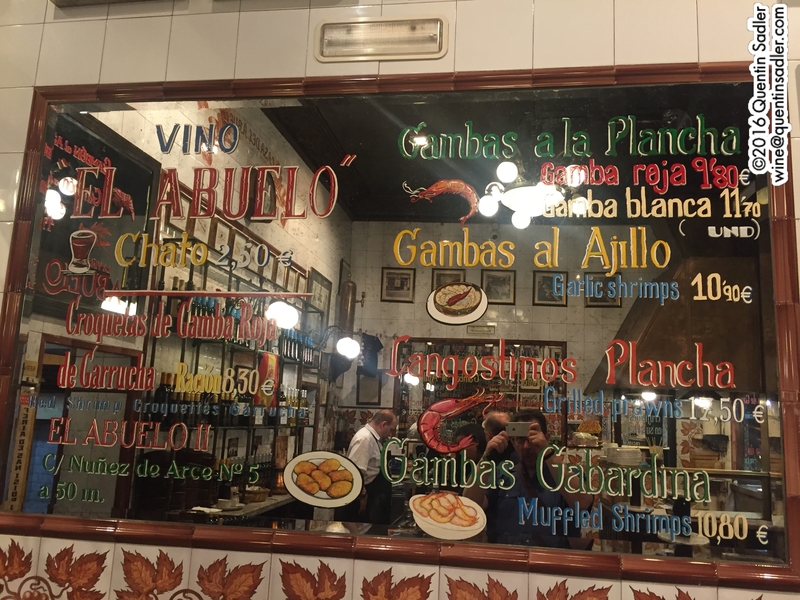 I bet you are wondering where this is leading, well recently I was in Madrid and was having a happy time in one of the great bars of that city of great bars, La Casa del Abuelo – the original one at 12 Calle Victoria. This Madrid institution has been around since 1906 – it seems that Ernest Hemingway was a frequent visitor during the 1920s and ’30s, but then every bar in Madrid claims that, and he drank so much they may well all be right – and it only serves prawns. The other branches have bigger menus, but the original one only serves gambas done six different ways. The classics are Gambas al Ajillo, Gambas a la Plancha, Langostinos con Gabardina (big prawns in batter – hence gaberdines or overcoats! They rather wonderfully translate it as muffled shrimps) and their Croquetas de Gamba Roja (red prawn croquettes – they’re really good). They have a small wine list nowadays, but the first time I went there – some 30 years ago – they only served 2 drinks, both of which are still available, a sweet red wine or a red Vermouth. Well on my recent rip I ordered the Vermouth because a friend had mentioned this particular drink to me – he actually ships it into the UK, and I was intrigued. I tried it and really enjoyed it, so have made it my Wine of the Week. I have long been an admirer of Bodegas Martinez Lacuesta. 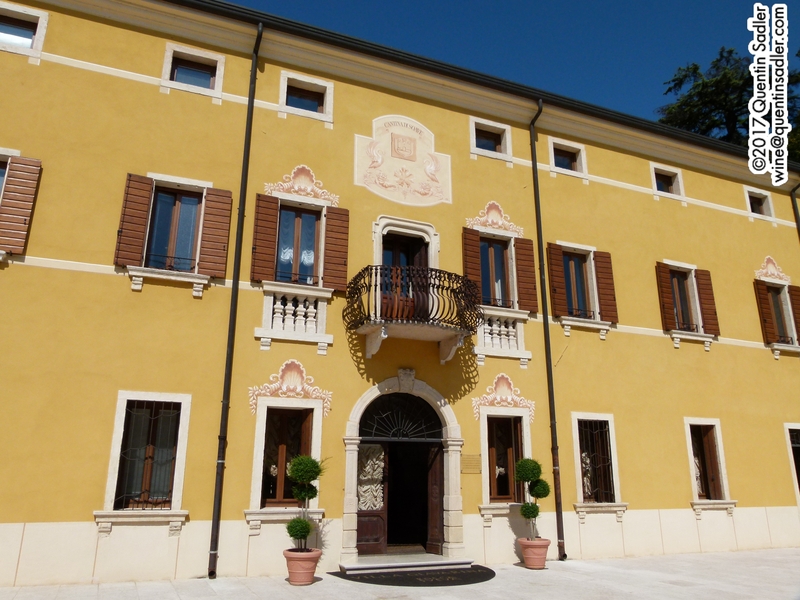 Founded in Haro in 1895 they have quietly got on with making superb wines ever since. They produce four different wine ranges, the classic Martinez Lacuesta wines and the somewhat funkier Comprador range which have more Garnacha in them than Tempranillo – Garnacha is usually very much in the supporting role in Rioja. Nowadays they also make make some excellent speciality Riojas and a couple of white Ruedas. ‘Vermut’ is a real speciality of the bodega – they have been bottling it since 1937, but I bet it has been made since the beginning. Nowadays they actually produce five different Vermuts, Blanco (white), Reserva Roble Francés (Reserva aged in French oak), Reserva Acacia (Reserva aged in acacia wood barrels) and a Limited Edition – Vermut Edición Limitada – which is aged in barrel for 14 months. However, it is the Rojo, or red Vermut, that is the mainstay of their Vermouth production. It is all hand made in small batches from grapes grown in Martinez Lacuesta’s own vineyards. The twist here is that the botanicals, herbs etc, are added to white wine and then aged in American oak barrels for three years – this also introduces sweet vanilla flavours that show up in the finished Vermouth. This mixture is then added to the base red wine along with sugar, caramel and alcohol and aged in French oak barrels for another three months. The nose is very complex with spices, herbs, dried fruit, toffee, vanilla and camomile. The palate is mellow with sweet dried fruit and an attractively herbal and medicinal character. There is plenty of richness and sweetness, but that is balanced by the herbs and touch of bitterness. I actually found it really appetising, invigorating and unexpectedly satisfying. I don’t think it went with the gambas, but it was a good drink. I drank it neat with ice, but I am willing to bet it would be delicious with a slice of orange and a splash of sparkling water or lemonade, or even some orange juice – 88/100 points. 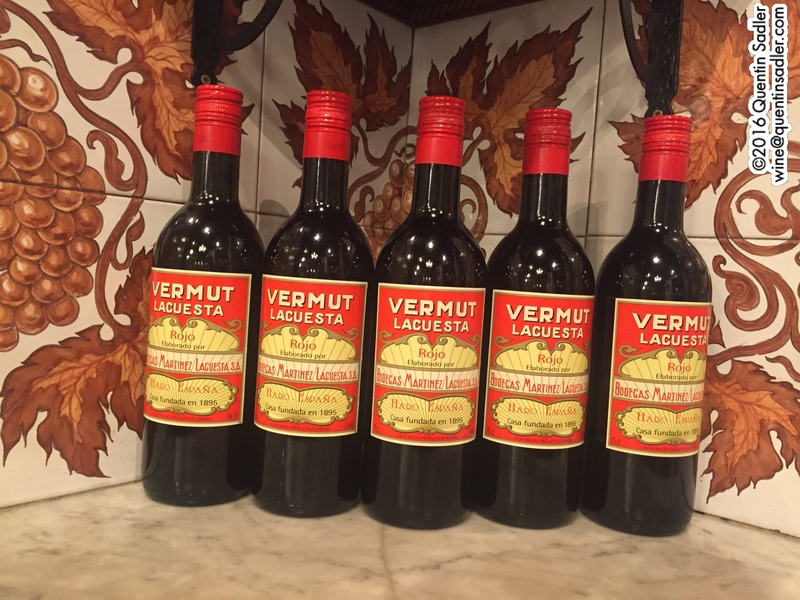 In the meantime, Vermut Lacuesta Rojo is available in the UK from Basco – formerly Greys Fine Foods – for £13.50 a bottle. Preparation: Put all the liquid ingredients in a mixing bowl with ice. Mix without shaking and serve with more ice and remember to add the olive, although I prefer a slice of orange. Wandering around Madrid I quickly realised that Vermouth is now big in Spain and is produced right across the country. There are plenty of examples from Catalunya, even from Priorat, some from Jerez, including those made by Bodegas Lustau, Cruz Conde Vermouth made from Pedro Ximenez in Montilla-Morilles, Ribera del Duero and there is even a Galician Vermouth made from Albariño grapes and I intend to taste as many as possible in my forthcoming visits to Spain. It is amazing to think that this drink that I had almost forgotten about is enjoying such an exciting renaissance and giving so much pleasure. If you are open to interesting and complex drinks, do give one a try soon. 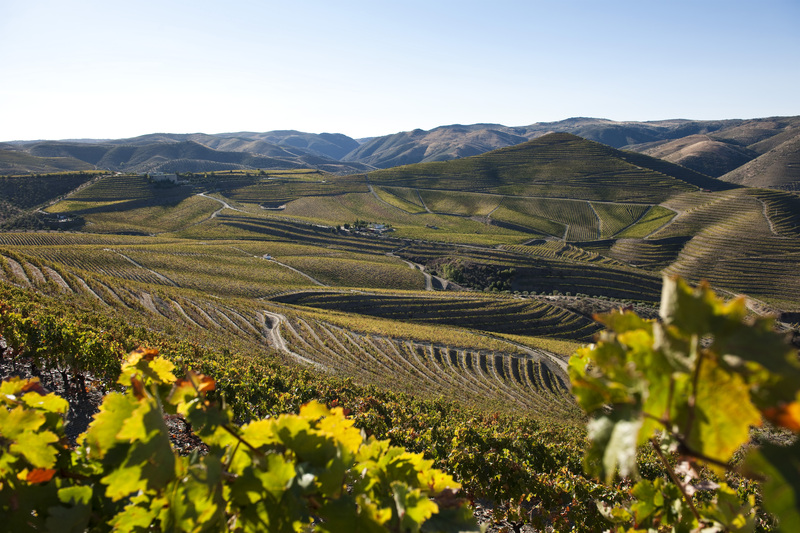 The beautiful Quinta da Leda – photo courtesy of the estate. 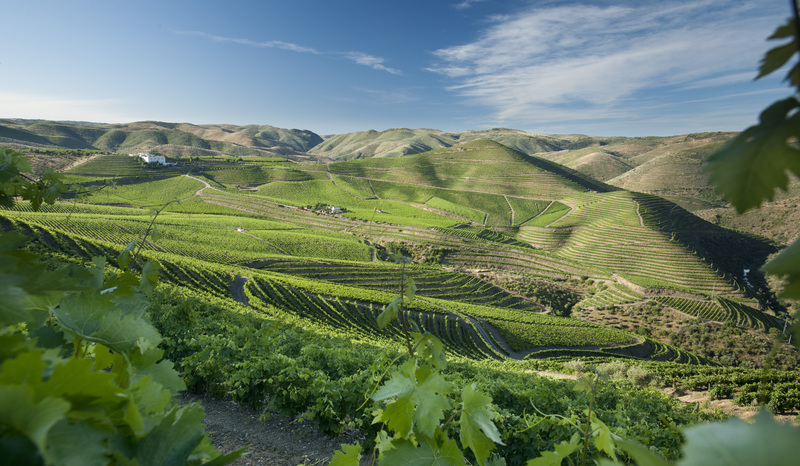 Many of you will know that I really admire the wines of Portugal‘s Douro Valley. It is a world class wine region that is of course most famous for being the home of Port, but over the last two decades or so has really made its mark in unfortified table wines too. 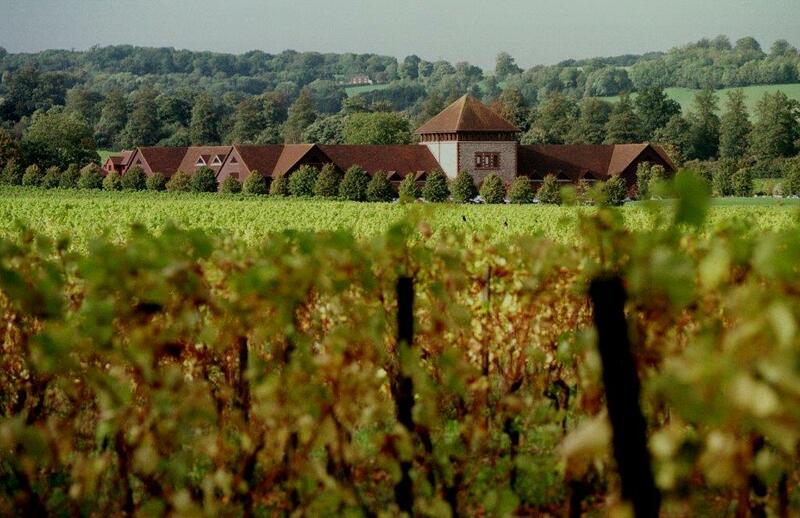 The quality can be very high, at many different price points and there are some seriously good producers whose wines are well worth seeking out. One of which is Casa Ferreirinha, which grew out of the A. A. Ferreira Port house which was famously run by Dona Antónia Ferreira – often known as Ferreirinha – during the nineteenth century. She was a close friend of Joseph James Forrester, Baron Forrester, who before his untimely death in 1861, had apparently campaigned for the Douro Valley to start making unfortified wine rather than sweet and fortified Ports. Perhaps that relationship planted a seed that was finally acted upon nearly a century later in 1952, when Casa Ferreirinha produced the first vintage of their occasionally released and legendary Barca Velha. That was the first non fortified red from the Douro for a few centuries and the first one to be commercially released and it was a hit, achieving cult status to equal Spain’s great Vega Sicilia. They don’t make it every year, in fact only 18 vintages have been released so far in total. When they don’t make Barca Velha, the finest barrels they produce make the almost equally illustrious Casa Ferreirinha Reserva Especial. Both of these wines are aged for a long time in oak before release. In 1979 Casa Ferreirinha bought the promising, but unplanted Quinta da Leda estate in Almendra just a few kilometres from the Spanish frontier. To see whether it lived up to their expectations they planted 25 hectares of Tinta Roriz – aka Tempranillo -, Touriga Franca, Tinta Barroca, Touriga Nacional and Tinta Cão vines. This is one of the great joys of Portugal, and especially the Douro, great wines that can rub shoulders with the most famous and most expensive from anywhere, all made from indigenous grape varieties. 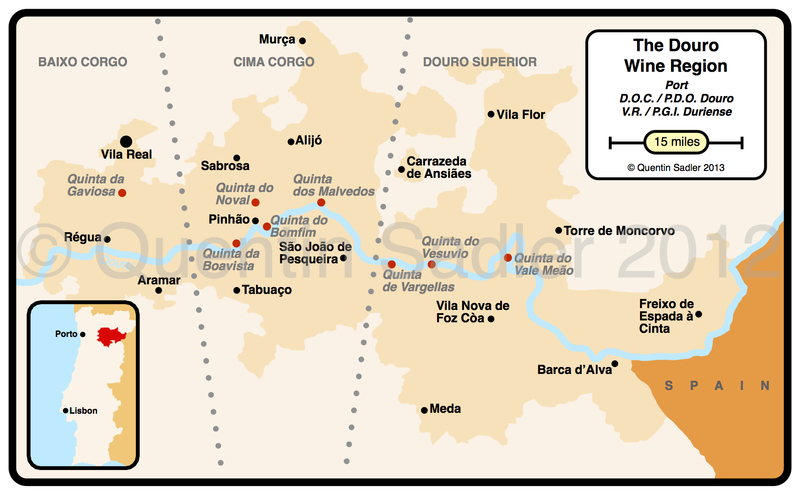 Wine map of the Douro, Quinta da Leda is just to the west of Barca d’Alva on the south bank of the Douro near Spain. Click on the map for a larger view. Within a decade they could see that their hopes for the plot had been exceeded and from the 1980s the vineyard had become the main source for Barca Velha and Reserva Especial, as well as producing Single Quinta Port. In the end the site was just so good that they decided to make a single vineyard wine from it, but only in the in the better years. The big difference with Barca Velha, apart from being a single vineyard wine, is that Quinta da Leda is aged for a more normal 12 months or so in oak, which makes it a fresher style and it can be enjoyed younger too. Sadly I cannot comment as I have not yet tried any Barca Velha, despite owning a brace of bottles of the 1982 vintage. The project has been a great success and a dedicated winery was built in time for the 2001 vintage, making these true domaine bottled wines. Recently I was fortunate enough to attend a tasting of Quinta da Leda wines that ranged from that very first 1997 vintage to the as yet unreleased, but precociously delicious, 2014. I loved them all and would happily drink any of them with a slow roast shoulder of lamb, but it was remarkable how I kept really loving the wines that came from great Port vintages – the 2007 and the 2011, stood out especially for me, but so too did the 2001, which is an underrated Port vintage, mainly being a source of Single Quinta Ports. However, without a doubt my favourite was the 2011 and so I have made it my Wine of the Week. A single vineyard blend of 45% Touriga Franca, 40% Touriga Nacional and 15% Tinta Roriz. The grapes were destined and fermented in stainless steel tanks before being aged for 18 months in 225 litre French oak barrels, 50% of which were new. The wine is currently an attractive opaque purple, deep, but bright and alive. The nose offers intense, spicy sugar plums and blueberry, as well as cedar and earthy, spicy, savoury notes. There is a touch of cigar smoke as well as some mocha and herbs. The palate is pretty full-bodied, but has a lovely texture, with concentrated, lush sweet black fruit together with some refreshing acidity and minerality. The tannins are taut but not overwhelming and there is a dusting of black pepper, while that smoke, spice and mocha vie with the lovely sweetness of the fruit on the long finish. All in all it is very concentrated, very exciting, beautifully balanced and utterly delicious with a touch of something pretty about it that helps to balance the power and the 14.5% alcohol – 94/100 points. Available in the UK from £35 per bottle from Slurp, Lay & Wheeler, Farr Vintners, Corking Wines, The Wine Library, Hedonism, Harrods and AG Wines. I actually really liked the wine as it is now, I loved the slightly tight feel of the tannins and the mocha-like oak, but it will develop beautifully too and become more complex over time. So you see, it isn’t only the 2015 Clarets that you should put in your cellar this year.